The Friends of the Collinsville Library take great pleasure in inviting you our annual Gala of the Decades. This year features a 1950's Luau. The event runs from 7 -9 PM on Saturday August 14th, at the Collinsville Library, 1223 W. Main, Collinsville, OK. Attire is fairly casual. 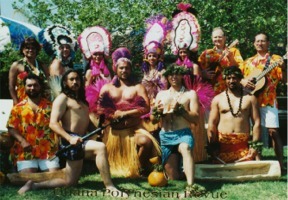 We do request that 1950's costume or "Aloha" attire be worn if at all possible. During dinner, guests will be treated to a live Hawaiian music performance. This will be followed by the Best Dressed Elvis contest, with a special prize for the winner. The evening's events will then move outdoors for a Hula-Hoop Contest, followed by our 2nd Annual Pie Auction and a Hula and Fire Dancing show performed by "Ohana 'Uhane No Ola" from Sapulpa. Adult tickets are $8 and Child tickets (Ages 10 and under) are $5. Tickets are available for advance purchase (recommended) at the Collinsville Library, and will also be available for purchase at the gala. All proceeds from this event go to the Friends of the Collinsville library and are used to fund events and provide for special needs at our local library branch. If you are interested in loaning 1950's memorabilia to display at the gala or donating pies for the Pie Auction, please call the Collinsville Library at 596-2840 for additional information. The Friends of the Collinsville Library (F.O.C.L.) is a group of volunteers who are dedicated to promoting and sponsoring events at our beloved Collinsville Library. If you are interested in joining The Friends of the Collinsville Library, memberships are available for $5 for individuals, $10 for families, $25 Donor, $50 Patron or Corporation, $100 Benefactor and $250 for Lifetime membership (individuals only).